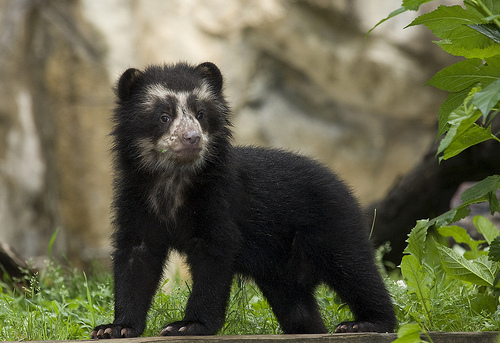 Andean Bear Cub Looks Askance at Double Taxation. was recently born at the Salisbury Zoo. He claimed that 65 percent of Wicomico County residents are served by the Salisbury Fire Department, while 25 percent of those served are paying taxes on those services. “The people who elected me to office are paying for that service for thousands and thousands of people who aren’t paying at all,” Ireton said. Saying it has been “69 days without a response” from Wicomico County on the matter, he did not quite go as far as saying he would keep fire and emergency services from serving outside the city limits. However, he said the so-called “nuclear option” was something that was on the table if county executive Bob Culver and members of the county council did not address the issue soon. The most prominent initiative was his call to place QR codes on signs in front of abandoned buildings, linking to webpages showing information about the property’s past and present owners. “I am tired of being the person responsible for everyone else’s dropping the ball,” the mayor said. Salisbury Mayor Jim Ireton spent much of his first term battling the five-member City Council. While Ireton wanted to pursue his reform agenda, a majority on the Council did its best to block him every step of the way. Indeed, they went so far as to amend the City Charter to transfer control of the City Attorney from the Mayor to the Council. The 2013 city election and a new redistricting plan should change all that. In 2013, Mayor Ireton won a second term with 68% of the vote over right-wing blogger Joseph Albaro, Jr. Equally interesting, challenger Jake Day trounced incumbent City Council President Debbie Campbell with 71% of the vote, thus shifting the majority on the City Council away from Ireton’s opponents. Day is the new president of the City Council. One of the orders of business for the reelected Mayor and changed City Council is to resolve the standoff over redistricting. During the past decade, Salisbury had two districts–one a black-majority district that elected a single councilmember and one a white-majority district that elected four councilmembers. 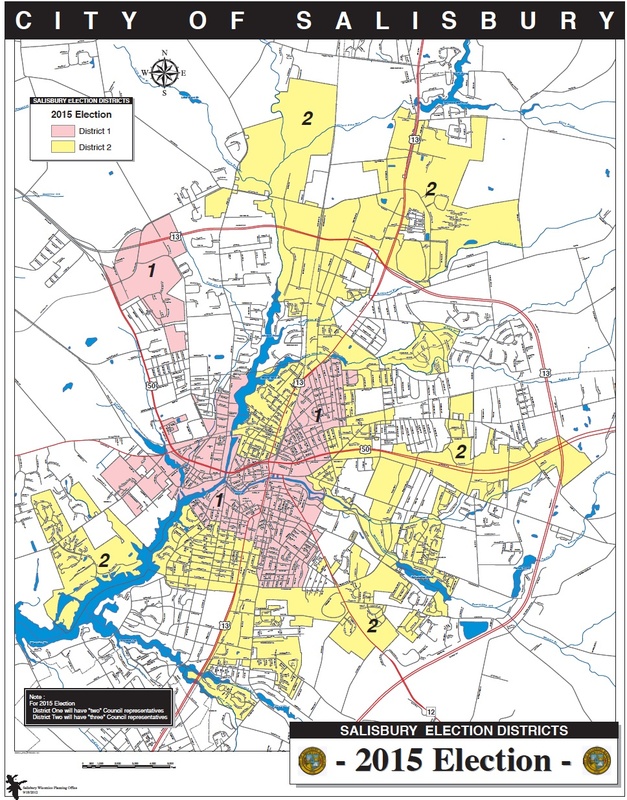 The old Council’s majority had enacted a proposal (shown in the top graphic) to redistrict such that Salisbury would retain two districts but the majority-minority district had two members while the white majority district had three. From their perspective, this plan had the major virtue of concentrating their opponents within the smaller majority-minority district. Both the ACLU and the Wicomico chapter of the NAACP objected to the redistricting plan. Besides making it easier for Ireton’s opponents to win election from white-majority district, the plan has also allowed the Camden neighborhood within Salisbury to elect a disproportionate share of councilmembers. Not a problem unknown here in Montgomery County where Silver Spring/Takoma Park dominate three of the four at-large County Council seats. The city can’t overhaul its districts alone. A 1987 federal consent order requires any substantive changes to be approved by a federal judge. . . . Although the council formally voted on the plan at the time, City Attorney Mark Tilghman said the council never directed him to file court documents. “I did not feel like I was authorized to proceed until this day, and I have been anxious to do that,” he said. Ireton would have had nothing to do with the action, Mitchell said, because the Cohen-led council had changed the City Charter to transfer the attorney from under the mayor’s office to under the council’s control. The new Council plans to adopt a new plan with five single-member districts (SMDs) that breaks Camden’s dominance on a more permanent basis. SMDs would eliminated the ability of a bloc vote to control the majority elected from the single multimember white-majority district. Put another way, it makes more likely that councilmembers reflecting a range of viewpoints will win election. The new plan will include two majority-minority districts. But the real question is, now that Mayor Ireton has a more congenial City Council, what’s next for Salisbury?